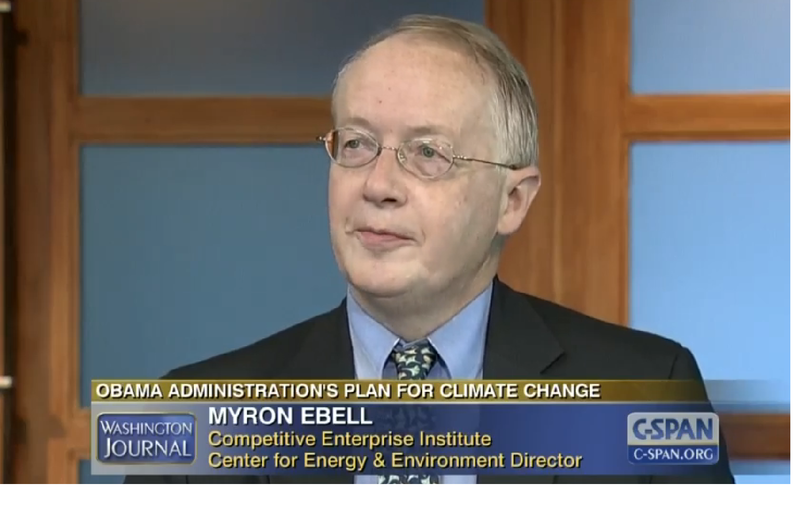 If you are wondering how Trump will dismantle EPA regulations and staff, meet Myron Ebell, the man Trump has picked to lead his EPA transition team. Ebell is Director of the Center for Energy and Environment at the industry-funded Competitive Enterprise Institute (CEI). Ebell's official bio is here. DeSmogBlog, which tracks PR experts who are funded by polluters, has an alternative rundown here. Ebell's work has been funded by some of America's biggest polluters. CEI jealously guards the sources of its $7 million annual budget, but research from records of Exxon Mobil and others show a long track record of taking money from polluters (ExxonMobil said they halted funding to CEI in 2006). In 2013, the Washington Post obtained a list of donors for CEI's annual dinner, providing a rare window into the companies funding CEI's operations. Energy companies gave more than $110,000 for the event, including money from Marathon Petroleum, Koch Industries, American Coalition for Clean Coal Electricity, and American Fuel and Petrochemical Manufacturers. The biggest energy donor for the evening was Murray Energy Corporation, the largest underground coal mining company in America and a vocal critic - and litigant - against EPA. In 2015, I probed Ebell on Murray Energy funding during a debate on C-SPAN. You can watch the short exchange here. After first claiming he doesn't "represent" companies, he went on to acknowledge that he wasn't getting as much money from energy companies as he wanted. SYMONS: Isn't Murray Energy your biggest funder of your dinner? They're the biggest coal company in the United States for underground mining. EBELL: I'd like to see a lot more funding from all of those companies, but unfortunately many of the coal companies are now going bankrupt. SYMONS: Wait, You said you don't represent the companies but you want more money from the companies? I have written previously about Trump's dangerous thinking on climate change here and here. Ebell is a ready match for Trump's climate denial. As part of a 1998 team that included Exxon and other top polluting companies, Ebell put together a communications plan to "undercut the 'prevailing scientific wisdom'" and convince the American public that climate science was uncertain. The plan identified the American Petroleum Institute, the National Mining Association and other industry trade associations as target funding sources. Ebell's work extends beyond creating scientific doubt. He also has a long history of attacking the Environmental Protection Agency. In a 2002 email to George W. Bush's White House Council on Environmental Quality (CEQ), Ebell urged the White House to discredit EPA's scientific reports on climate change and to fire EPA Administrator Christine Todd Whitman, the former GOP governor of New Jersey. Andrew Revkin, formerly the environmental beat reporter of the New York Times, recounts some of his encounters with Myron here. "The natural warm up since the mid-nineteenth century, the end of the Little Ice Age, is climate change that all can applaud." - Cooler Heads Coalition newsletter, Dec. 2014"
If you think that Ebell's work to create doubt about climate mislead the public, it is not a coincidence. In researching this blog, I uncovered some new information about Myron Ebell's start in the world of corporate-funded advocacy. As part of the tobacco lawsuits, a trove of documents have become publicly available, and an online search revealed the tobacco-funded roots of Ebell's past. The tobacco archives inlcude a 1996 letter from Ebell's early employer, Frontiers of Freedom Institute, to Samuel Chilcote Jr., president of the Tobacco Institute, the lobbying arm of the tobacco industry and a Frontiers funder. The letter spells out how funding from the Tobacco Institute helped Frontiers both in "protecting the first amendment rights of the tobacco industry" and in "hiring Mr. Myron Ebell as our policy director." In another document sent to Philip Morris in 1998, Frontiers requests more funding from Phillip Morris for several staff, including Policy Director Myron Ebell, as part of a broad campaign to make regulating the tobacco industry "politically unpalatable." Also from the tobacco files: Philip Morris funded CEI in the 1990's as CEI advocated for acceptance of "safer cigarettes." One of the professional deniers who surfaces in the movie is Myron Ebell of the industry-funded Competitive Enterprise Institute. For many years, Ebell's full-time job has been to stave off climate action by keeping alive the impression that the scientific debate is wide open.... "The public doesn't agree with me," [Ebell] conceded. "They say, 'If there is warming then we have a moral obligation to solve it. If there is not, then we don't.'" And that, in a nutshell, is what the denier PR machine doesn't want you to know--and why the Merchants of Doubt have been working for so long to stir up doubts about the science. 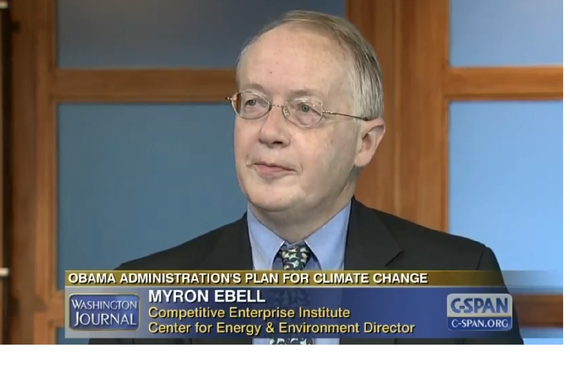 By selecting Myron Ebell to head his transition team, Trump has given special interests a dangerously influential position to damage the Environmental Protection Agency. Trump's stated goals of dismantling EPA through budget cuts and regulatory rollbacks would cripple America's highly successful landmark environmental laws, such as the Clean Air Act and the Clean Water Act. Rolling back clean air and clean water regulations would leave our most vulnerable populations - young children and infants, the elderly, the sick - at the mercy of the good will of corporate polluters. Cutting funding for enforcement will increase the risk that bad actors run amok as responsible corporations do their part to protect public health. Nobody is safe from the dangers of air and water pollution, but impoverished and minority communities around the nation will be open to the kinds of injustice faced by the residents of Flint, Michigan from lead contamination of their drinking water. For more than 40 years, the Environmental Protection Agency has been ably guided by Democratic and Republican presidents and their appointees. EPA's efforts under the Clean Air Act alone has saved hundreds of thousands of lives and improved the lives of millions more. In monetized benefits, the health savings of the clean air act have been between ten and one hundred times as great as the costs. Given the agency's strong track record of effective, common sense results and stewardship, it is not surprising, but easily forgotten, that Republican and Democratic Congresses alike have funded the agency sos that they have the resources to do their job. And, as EDF's Tomás Carbonell details in this blog, the courts have repeatedly backed EPA when they act to protect health and the environment. These same courts are likely to take a critical view of any president's efforts to eliminate or roll back these same regulations, but that is thin reassurance when so much damage could be done before the court intervenes. "Republicans have a long history of support for the environment dating back to Theodore Roosevelt. Donald Trump threatens to destroy that legacy of respect for the environment and protection of public health.... He hasn't a clue about Republicans' historic contributions to science-driven environmental policy: the incontestable environmental improvements in the restored lakes and rivers, the acid rain controls, the reduction of key air pollutants by 70, 80 and 90%, and the sharp decline in pollution from automobiles even as their numbers more than doubled." This is a hugely consequential election; the stakes are that high."